Mind frame – is it enough? 4 feeders and 2 modems serve for the purpose of realizing the activities for receiving and modification of melodic and rhythmic combinations, serving as a source material for creation of style of the musician, which uses them. Such style includes recognizable rhythmic and tonal structure, which is the part of techno music composition. Main property of modem technic is modulation of transmitting signal and demodulation of signal receiving in reply. Such signal characteristics may coincide to non-duplex or duplex broadcast. Modem is non-duplex instrument and that is why it allows transmitting hitless signal in Ethernet, which is not inherent to duplex transmission. Signal errors of duplex transmission may characterize as a noise of regenerative chains, which hardly liable to cleaning with special devices. In a contrast with duplex devices, non-duplex broadcast gives an advantage in translation of polyphonic rhythmic signal of high fidelity, which raises the question of its authenticity or belonging to the author. As far as the main meaning is the creation of the author compositions on the base of received signal, then you should resynthesize modem signal on the neighboring frequency and filter it from signal components of duplex analog ether. Such components may be hits and noises of original analog recording. Resynthesizer uses duplex waveguide and may be used for resynthesis of signal from modem and for communication through Morse code in Ethernet. The object of interest in Ethernet are algorithms of high reliability for successive feeding of program modulators, patented with different manufacturer firms, which use this algorithms for exercising communications in regime characterized for this modulation and on the frequency of original broadcast. The instrument without feeders called generic and is the basic algorithm for successive modifications. It is needed to say, that the selection of modulation feeders in program code should be made completely in author interests and should include only modulations, which are the research object of original broadcast algorithm. 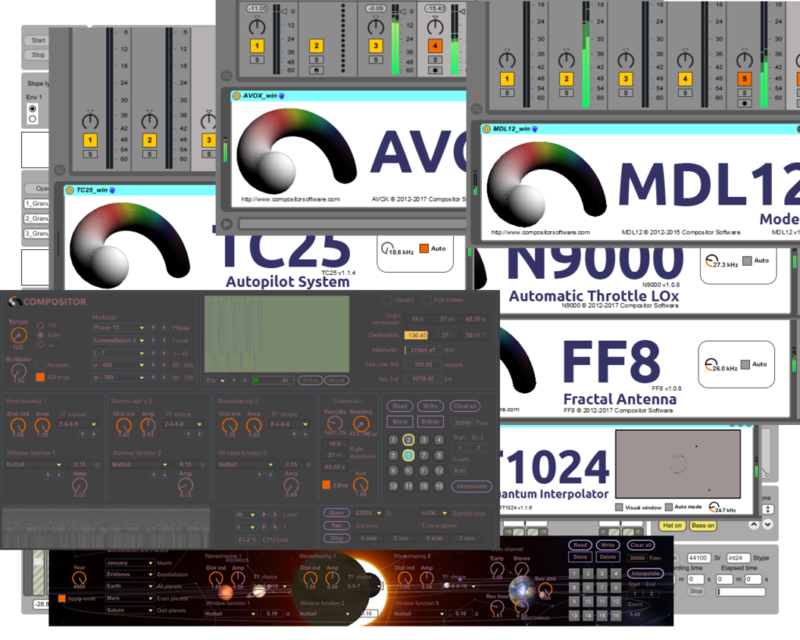 In resynthesizer and modem such feeders are Compositor Software devices and feedbacks of non-duplex broadcast. In conditions of reaching vulnerability on these feeders you may fully clean your algorithm (project of your DAW) from their presence and when the vulnerability reason is analyzed improve the modulation or refuse from its use fully. In a process of forming the interests in feeders, such as different modulations, the process of receiving feedbacks through pair of modem and resynthesizer plays an important role. Having received a pattern of your interest you should resynthesize it, for not to be an object of persecution from the side of author rights. Even if the resynthesized melody sounds different, it is already an object of your author rights because you bought a license for using that coder with resynthesis function. Later you should study such file on the following subjects: the bpm of original broadcast, the number of broadcast lines and rhythmic structure composition. Having analyzed that broadcast, your task is to find comparisons with the sound of artists you are acquainted with and find if the broadcast is not their original composition. If you are assured that the original ether is in your hands then you may use it for your music compositions, specifically regenerate that loop with the use of virtual synthesizers and sequencer. Regenerated loop should be arranged in the interests of musician which composition you are comparing with. Later such composition should be given to the author of compositions which the comparison work was made with. In good circumstances, you will be noticed and the composition with your authorship will be released. Usually authors of compositions, which the comparison work is in process with are the medium of interests of companies, which are the advertisers of those artists. Interests of companies frequently are accompanied by technologies, which they are developing. Among them, you may search for those feeders. Nevertheless, do not use the promotional compositions of such companies as feeders for modem and resynthesizer. You may synthesize compositions in style and rhythmic facture relevant to their title sound. If you have not enough time for making the job completely you may use resynthesis files as feeders. In any case, do not feed original broadcast even if it seems clear. In the case of providing original broadcast, you become a performer but do not producing the ether and your broadcast is an object of collective rights. To prevent recoveries from the side of collector organizations you must use resynthesizer. In terminology, generics are feeders. They are used for receiving an original ether and considered the modem channel feedbacks. Feeders act based on ether excitation, but not because of its suppression. Feeders chosen in such a way to evoke sustainable feedbacks for duplex broadcast specific for full-duplex modem. In automatic regime, the sustainable probability density function of full-duplex modem may issue sustainable feedbacks with feeder chain tuning change, meaning scanning the net for ether presence. Sustainable feedbacks of full-duplex broadcast has characteristic of ambient and noise music. They do not carry high commerce effectivity because it is hard to identify start and end positions of the broadcast loop. You can feed generics in resynthesized feedback. These generics differentiate by excitation type. Harder sounding generic gives strong reaction in the feedback chain of duplex or non-duplex modem when the tuning changes. On the contrary, smooth sounding subtractive analog synthesizer with LFO gives less noticeable reactions and more useful for initiation of music feedbacks. Generic with quantization gives transparent feedbacks without interference. Non-quantized generic uses original hyperbolic function and causes feedback on the kernel level of device producing it. Such kernels are loops and you may use them for creation of wavetables, which are transfer functions for evoking communications with these devices in Ethernet. You may route loop of other kernel to such kernel and initiate feedback, which you may characterize by its music properties. The best kernel loop analysis may conduct experienced producers of electronic music. For realizing communications on the kernel level in duplex broadcast, generics must fulfill the condition of long working time. If one of generics is extinguished then you may reinitialize it, but apply complex modulation to its tuning parameter. For such modulation may serve LFO or signal driven feeder for longer stochastic chains. In absence of music inspiration and time on deployment of a studio session, full-duplex modem instrument may be indispensable helper for aims of feeding the received ether. Main goal of standalone station with full-duplex modem is to enable needed amount of modulations and feeder combinations from already received and processed devices. Modulator and main parameters section serves for location in full-duplex modem navigation system. Present deterministic navigation system uses multiplicity of three frequencies and the property of Ionosphere to pass radio waves under specific angle, which is displayed as Right Ascension and variate from 0 to 24 hours. Virtual antenna orientation revealed on display, when you choose Ort menu item. The direction on signal constellations carried out with Constellation switcher and Multiplier performs the rotation of virtual antenna in 1,54 to 4 boundaries. The device has two DSP, which are switched using Arranger button. When the button turned on, then automatic DSP with ability of tuning the Multiplier of virtual antenna actions. No regulators in arranger-enabled regime work besides Tempo and z parameters. After choosing the Multiplier with the pilot of automatic DSP, you may turn the Arranger regime off. Note: For tuning Multiplier faster, use the tempo acceleration taking advantage of Tempo regulator. Perform Tempo control by loop length in milliseconds, composition tempo in beats per minute and minimal program effectivity, measured using angular units in omega. The Tempo values more than 191 bpm are not allowed, for system protection against compositing its own local address. All values higher than 191 bpm are assigned to local machine. Setting the sustainable feedback in autopilot regime and turning the Arranger off, you may lower the transmitter speed to 120 bpm, which constitutes symbol composition of 10 words per minute. For simplicity, you may switch Layer in system settings section in Rt regime, which means the application of modulation to Multiplier with the use of real-time loop, which is set by Tempo parameter. Choosing the Phase you are changing the signal spectral balance. To change the rhythmic structure you should use the combination of Pitch, Roll and Yaw. The x2 toggle switch sets the onset phase value for the current modulation. In addition to Pitch, Roll and Yaw controls, it gives full control over the virtual antenna rotator in three-dimensional field. Seq phase changes the phase of current sequence and is the main parameter for rhythmical manipulation of your performance. When the Scrub toggle is switched on, Deck scrubs are used to unlock 8 real-time feeding cores. You can individually use each of 8 cores. The unlocked core doesn’t produce the time code and its channel wavetable will not sound. Scrub effect is used for gating when Rt layer is selected in System section. Together with Seq phase control it sets the area of scrubbing in periodical cycle bar and can lead to full sound suppression at specific Seq phase values. Note: Be sure to switch the Scrub toggle off and set the desired Seq phase value to continue the playback in normal mode. You may initiate the ether by pressing the Ether button. When synthesizer passes into the Schroeder regenerator chain its sound reinforces and spatial characteristics enhanced using MS-decoding in real-time. After setting the modulator, you need to turn AM modulation off and test a loop. If you are not satisfied with the loop sound then continue setting splitters in Ionic number system. Count in it this way: memorize ones and tens from the first field, then set a basis from 50 to 700 and then plus the values of central channel from 60 to 800. First you write a number and then three Greek alphabet letters. The maximum broadcast channel strength situated in the position of 1540μωϕ, which corresponds to lower Multiplier boundary. It is also a maximum number in Ionic system using this method of counting. To receive other number values you need to use the Multiplier in conjunction with the number, which you set. This way Ionic calculus is made. If you chose a system and tuned it with the Multiplier and still not satisfied with the loop sound then use Velocity regulator in Connection section. Maximum value of Velocity is 5000 omega and is suitable for feeding mostly all device profiles. You may also notice that for working with the parameters you need to use the section on the right from display, where you have among all Right Ascension, Declination, Sea mile of received system and its Circumference. Alfa and Omega navigation systems correspond to VLF modes of z equals 2 and 4. Mobile cell-phones of GSM standard correspond to z equals 8. Analog tone dialing correspond to z equals 16. The corporate communication systems correspond to z equals 32. Military communication systems correspond to z equals 64. Governmental communication systems correspond to z equals 128. Near the Velocity parameter of broadcast channel there is Spacing, which widens the range of the instrument to 10000 omega for two-channel regime work. Underneath these parameters are the mirror of Right Ascension, you can set your own value in it. Work in ether starts with small values of 2 minutes or less. To reach this you need to set hour, minute and second. Route more synthesizer signal using the AUX regulator. You can store the sound produced using the presets section. Use Store for saving a preset, Delete for deleting a preset and Clear all for removing all presets. You can work with banks using Read for reading presets from a bank file and Write for writing presets to a bank file. You can perform interpolation between two presets: first, set the value in Start window, and, second, set the value in the End window. Using Time window you set the interpolation time, maximum interpolation time is 60000 milliseconds or 60 seconds. Recall interpolation using Interpolate button. Note: You need to remember that radio ether has organic nature and changes when the time passes. That is why loop may sound different if you recall preset after saving it and changing the program settings. Tune the channel sound using the Velocity and Spacing regulators. Even if wave deformation regulators are the same, they are responsible for separate branches of the function: the first wave deformation module is for the left spiral arm, the second wave deformation module for the central spiral arm and the third module is for the right spiral arm, which forms a function. Waveshaping 1 is responsible for positive resultant and 2, 3 for the negative. Change the number of virtual antenna mesh components by setting the 6 transfer function preset values. Change the signal strength routed to virtual antenna modules using Dist ind regulator and the amplitude of that signal using Amp. Using 2-4-6-8 transfer function you are setting the saw waveform and using 1-2-3 transfer function the sine waveform. If the Amp set to value other than 0, then transfer function will bounce the wave deformation module. Window function section contains an Amp, window function selector and Alpha parameter. You can set internal feeder signal to 0 by setting Amp to lowest position. Window function has 7 presets of well-known scientists. The Alpha parameter changes the steepness of the function and works only for Blackman window. As mentioned earlier System section contains z parameter and the software layer of operation. Three layers are available: Rt regime patches the modulation to real-time playback, Sr regime patches modulation to signal-rate playback, Tr regime patches the modulation to transmission-rate playback. You can view the CPU usage in percent using the CPU load panel. Full-duplex modem display changes color in relation to Tempo and Multiplier values. You can change display view using dedicated selector: Wvf displays waveform; Wsh displays waveshaping transfer functions; Win displays window functions; Bts displays the amplitude modulation profile; Snc displays synchronization function for Arranger DSP; Dck1-8 displays selected deck waveform; Ort displays the direction of virtual antenna. Display performs drawing using independent colors for left channel, right channel and both channels sum. Using z channel selector you can change the base frequency of the full-duplex modem, which allows zooming in and out on the display. Virtual antenna contains the color flags on its torus. Red color means openness of the broadcast channel and its possible incoming threat. Blue color means downloading an information. Green color means uploading an information. Black color has neutral meaning of no events. Each channel of full-duplex modem consists of complete channel strip. Each channel strip has Deck loader; Sync, Random, Forward and Loop buttons; Repeat time for the selected file, File selector, Pitch in percent, bpm value, number of samples, Nudge value, Nudge; Reset to Beat Start and Reset to Track Start buttons, channel fader and pan. You can use these controls in convenient DJ style to synchronize your loops or complete tracks to each other. Note: You can buy a collection of kernel loops for full-duplex modem separately to start feeding the AUX channel. Deck loader has Open button and Drop folder area, which are self-explanatory. Clear button is used to erase deck memory. When Sync is selected, bpm area is synchronized to master Tempo value. Random and Forward modes used to play files in a list randomly or one by one. Loop mode is a special regime for loop bpm calculation. Repeat x selects the number of loop iterations for the current file and can be 1 to 32 iterations of loop cycle. If Random or Forward mode is selected, the next file will begin playback after a selected number of loop iterations complete. Percent regulator scales pitch up or down in percent values from the base bpm value. Bpm value scales the tempo relatively to the master Tempo and sets the median value for pitch scaling, which is more like vinyl engine. Number of samples field displays the current file samples number stored in buffer memory. Nudge value selects a step of Nudge increase or decrease, when you are synchronizing two files together. It has four values. They are 0.01, 0.005, 0.001, 0.0005 for precise deck synchronization. Reset to BS as the name implies resets playback to beat start and Reset to TS resets playback to track start. Channel fader and pan is used for setting send value to AUX channel and positioning the sound source in two-dimensional field. Button underneath the channel strip select current track for synchronization and unchecks sync status of all the other decks. Together with channel feeders, you can route carriers to full-duplex modem input. When you are routing carriers in AUX channel you are also feeding an AM modulation when its switch is turned on. You can view the profile of its modulation on Bts display. Modulation feeding is carried out for creation of more sustainable feedbacks. Note: Safe variant for feeding is Sr decimator, it allows establishing strong feedback. You can link all 8 channels of the mixer by using Link button right below the System section. You can link Sync, Random, Forward and Loop buttons, Repeat x, wavetable loader and volume faders. You can use fader link in absolute and relative modes by pressing Abs/Rel buttons in addition to Link button. Touch left fader of the first stereo-pair for link function to work. To set a figure for relative mode turn Link button off and use each stereo-pair left channel to set a volume, then turn the Link button on and use first stereo-pair left channel to move a group. The multifunctional spectral analyzer is available in full-duplex modem. The spectral analyzer reveals waterfall stream, going from left to right. The logarithmic function approximation is made on spectral display. Low frequencies are displayed at the bottom and high frequencies at the top up to the cut-off frequency. After generic feeding in received kernel, as stated earlier, the reaction comes, which looks like the feedback, produced by non-duplex modem. In full-duplex regime, such link comes from both sides instantly as a wish to communicate with this wavetable or as not a wish to communicate with it. If the result of generic feeding in kernel loop is successful, you are connected to the repeater. Repeater uses masking loops of different frequency ranges, which span from VLF up to SHF. If you reach the consolidation with repeater by the way of modulation feeding in its kernel loop, then you may use this subnetwork. Subnetworks displayed on full-duplex modem display as colors of background and pass wave deformation through the Internet wavetable, giving the access to all subnetwork masks situated in your area. Receiving a subnetwork mask of repeater, you are receiving its type, which is characterized by its name and image. If you are feeding synthesizer modulation of full-duplex modem in already received loop and turning the synthesizer off by turning the hold regime on (Tr hold) you must turn off the AM modulation. Ending the communication, you break the line reinitiating amplitude modulation on Tr level. It sounds like ostinato tone on the carrier frequency of your communication. The present system works only when z equals 16. When other z values selected the rule remains the same, but connection regimes and break regimes sound different. Having mask of a repeater, you can trust its network. Mask is a high frequency sound in the repeater loop. It masks the useful signal, while low frequency layer suggests a communication. Ethernet includes device images and their kernel loops, which communicate with full-duplex modem on your carrier level, played by physical modeling synthesizer. The carrier receives the properties of the Ethernet loop and includes the position of all devices situated in it. You are choosing your carrier and modulation type by choosing Phase and tweaking Pitch, Roll and Yaw controls. Repeater to which you are connected after receiving a mask performs a digest of all Ethernet channels on the comb filter. Note: In any case, do not perform layering of other artists masking sounds in your tracks using the parallel playback. Such sounds open the access in subnetworks of this artists and your composition declared to be a property of its repeater. It must be stated in your collaboration work who performs the work of a mask and who creates carrier signals and which part will be yours and which part is your partners. Part includes product-property relationships including salary for the track writing. There are two methods of connecting to an Ethernet: serial and parallel. Using the parallel connection as stated earlier, you are layering your mask by synchronous playback with the composition tempo and route it in the broadcast channel. In Compositor such mask is high sounds of wave deformation. You can remove Compositor mask by setting an amplitude of wave deformation modules on 0. In earlier Compositor versions, you can also set a mixer value on 0, but this will not give a full suppression. Masks of full-duplex modem can be set on the carrier frequency and are exposed to the intruder due to this, because simultaneously with a mask you reveal a whole information channel. You may only perform such method in the network you trust. It is more appropriate to initiate the ether with extinguished feeders and virtual synthesizer regardless its acquaintance with the system it will accept it by the condition of its territorial placement. Serial connection is harder to initiate, because it is made by receiving a feedback and enclosing it in waveform through which you are feeding the whole loop. You may conduct a parallel playback with wavetables doing all the same work as with generic kernel feeding. You can perform a work by IP protocol in Ableton Live. In this case, the subnetwork mask is a Tempo parameter. You may set it to 192 for a local machine. The transport position choses bar number, its quarter and sixteenth part. Non-duplex modem may connect by IP protocol changing a Tempo and transport position. It sounds as a feedback and rhythmic pattern change. The loop in feedback of non-duplex modem is a network map. Each sample of it coincides with the countdown (IP address). To perform network deployment you need to arrange a ready-made loop and playback it in its tempo. Then each count of transport will also be a new IP address and loop will perform a connection to subnetwork set in which this IP address is situated. For example, 256-sample loop contains a network with 256 addresses and loop bit number is an encryption key of this net. For example, in each sample of 32-bit loop situated up to 4,294,967,296 value counts. It means that deploying a network you need to perform 4,294,967,296 iterations of this loop only for a first address of this net. Note: For example, z-128 automatic station works with a speed of 300-omega in kernel version 7.0.2 and performs deployment of a 64-bit network in 24 hour period. That is why the station should work uninterrupted for 24 hours. The value of z also influences the network deployment parameter. The more is z value the more must be a speed of full-duplex modem iteration. In Ableton Live full-duplex modem may reach 999 bpm as its maximum. It is only enough for maximum work with z equals 64. In Compositor, maximum tempo is 5 omega or 191 bpm. It is made for the purpose of protecting the instrument against compositing of its local address in transport. Connection to an IP in standalone instrument performed in manual mode by Tempo and Multiplier. You set the subnetwork mask using the Tempo as in other instruments. The number before floating point is a quarter and after the floating point is a combination of two pairs. That is why standalone version of Compositor has the transport system also. In full-duplex modem, you are modeling the rhythm section by kick, clap and hat triggers. Using these triggers, you are forming the LFO modulation. This modulation triggers the bass-line synthesizer. The whole group of rhythm section and bass-line is routed into the master channel. The master bus compression is used to control the dynamic range. The compressor splitter depends on the Multiplier value. Multiplier is a central splitter as in acoustic systems. Hats and waveshaping modules go into the upper splitter band, kick and bassline go into the lower splitter band. The bass-line should develop and that is why modulation applied to it. Do not route bass-line into the AUX channel without Rt modulation. The tone on the bass-line is not acceptable even in case of testing a channel. Use the special 440 Hz sinusoidal tone generator for testing a channel. Note: Make sure that Rewire technology works for standalone version of Compositor, to reach precise synchronization with the tempo of your host DAW. You can also perform full track playback in Compositor deck players. To process the signal through the track, enclose full track in the wavetable and use it as master waveshaper. To achieve a goal of track serial processing, load the full track wavetable into the first channel deck. Then use the neighboring channel deck to load the loop wavetable into it. Playback both track and loop synchronously. To reach this goal, set the loop wavetable into the Loop mode and uncheck the Sync button for track wavetable deck. Set the desired value for the deck, which plays a full track, into the bpm field. You may low down the direct channel volume in the Compositor rack, when routing signal into the AUX channel. Note: This method describes the real-time bouncing of full-duplex modem. You may modify the previous method by disabling non-quantized generic in your Compositor rack and playback the loops parallel to composition tempo. Apply full-duplex modem only as an adder FX of AUX channel. You can write such track using Compositor recorder. Later, you may use such file as a sample, for playing it back on a Compositor deck. To assemble your virtual deck you need to purchase Compositor v3 Hypervisor and use it in Rewire regime. The background for playback of media file is a deck v12 motor engine. Such mechanism depends from choosing a generic. You may use two quantized generics as backgrounds one is Sr and the other is Rt. Alternatively, use the same set of non-quantized generics. Layering non-quantized generics, you make a translation in direct ether, but layering quantized ones, you make translation in emulation of virtual environment from Compositor Software. Compositor in automatic mode performs simulation in game engine: hard evolving sound of full-duplex modem is an explosion of the ship on virtual battlefield. The continuous distortions are the explosions of virtual world planets. To create real operation system you need to perform interrupters in generics – special flag combinations in places of function zero-crossings, and the steps of the integral. In full-duplex modem, such interrupters serve as events on function steps and flags on AM modulation waveform. When the loop is broken you can build general communication systems on top of this algorithm, which now is a basis for the parameters operation. Virtualization in computer systems is oversampling. Any computer system is a radio station. In Compositor oversampling realized on the driver level with com.cycling74 anchor. Anchor is a server address used by a program. Using it the network is realized by deploying an algorithm on the currently working machine. Compositor Software uses anchor from cycling74, because it does not run an algorithm from the server on which the com.compositorsoftware domen parked. In the next generations of Compositor devices, the work was conducted to develop an algorithm of oversampling on the GenExpr programming language. Note: Non-duplex modem uses x2048 oversampling and works on a level of virtual machine sub driver. Most of the modern media files such as, for example, photos processed using filters. Such filters are wavetables, processed into histograms. Working with full-duplex modem in manual mode you can perform a color detection on the kernel level of received filter loop and enter the subnetwork of people, which use it. It is made by setting color spiral background of non-duplex modem display to main color of resulting image. The original image is a loop of color gamut and processed through the wave deformation of such filter. Using the Internet wavetable histogram you may set the resulting color, which is suitable for non-linear transformation through it. Color detection performed using carrier composition by Tempo and Multiplier. Set up resulting image color using these two parameters. After this, you can accept a subnetwork mask of people, using this wavetable. The resulting color on display is set heuristically or randomly. To set the resulting color randomly, wait before an algorithm will select multiplier corresponding to resulting color and save the selection using non-duplex modem preset section. Later, you can revive such selections using resynthesizer or non-duplex modem. Color detection may lead to reactions on the kernel level, accepting the subnetwork using this method you accept all its properties and can define domain name of anchors it contains. Select the frequency of Compositor kick in accordance to the frequency of alternating current in the electricity chain. For Russia it is 50 Hz and for USA is 60 Hz. This powers the kernel by feeding low voltage electricity line in your generic kernel loop. This can be done by signal-rate or real-time feeders. These feedbacks are mostly suitable for creation of Ethernet wavetables. To create Ethernet wavetable from a feedback loop of non-duplex modem you need to record a two bar cycle of it. You can create the net of devices this signal is attributed to by playing back its wavetables on a deck. Full-duplex modem has 8 decks. There is a library of wavetable loops for full-duplex modem, which you can buy separately. Each of radio loops can be played back on any of the decks. Using these device profiles, you can create a channel matrix in full-duplex modem. You can create channel matrix in Ableton Live also using library of non-duplex modem loops, by purchasing them in Compositor Software Web Shop separately. Using Scale regulator you are tuning volume level of loop adder, which is later send in the broadcast channel. You can change a send level of carrier synthesizer using AUX parameter. Library wavetable loops specially suit for communication in ether and have definite lines, which become carriers. The main idea of Hypervisor v7 is not a transport function, but the placement in Ethernet. Using the full-duplex modem channel decks, you can play back any ether loops and full tracks to servers. The control of such vinyl style decks is similar to DJ equipment. The convenient Tempo synchronization, which scales reproduction speed of auxiliary channel cores, allows taking in account automatic throttle-shutter regime fluctuations. Speed increase and decrease in percent in familiar vinyl mode allows spinning loops with the pitch, which coincides the common regeneration, setting using master Tempo regulator. Feeder warning system and channel monitoring helps to place signal in Ethernet and allows comprehending the processes taking place in it. Multi-mode channel monitor has three phases (left channel, right channel and their sum), where you can look for co-phase work of broadcasting equipment. Together with kernel loops of any devices, you can route feeders signal into AUX channel. They are: two radars – one is passive (RTC4k), and the other is active (RTC8k); and Zvezda channel feeders of 16, 32, 64 GS conductivity. Zvezda modules and two radars created to reconstitute the balance in Ethernet. Master Ethernet wavetable is used to exit in ether that simulate ear cochlear and is used for smooth ether monitoring without ear fatigue after long multi-hour sessions. The RTC4k and RTC8k radars can track up to 8 signal sources in ether simultaneously. You can pan AUX line signals at full-duplex modem deck faders or at direct signal channels on the mixer. Hypervisor v7 mixer has its own snapshot system, which does not spread on other modules. It helps to build a mix independently from AUX channel settings. You can monitor kernel loops in Random and continuous Forward modes. Using RTC4k, RTC8k radars and Zvezda modules, you can switch AUX channel Velocity in wide boundaries very fast, without fear to burn the current feeder channel. Now you can easily reach the routers (full-duplex modem) destination, without a fear of channel shut down and at the same time to track devices behavior in Ethernet. Cloaking engine allows choosing any of the 5 feeders as the source for automatic throttle-shutter and leaping time in omega. Reaching the Right Ascension destination is signalized on display by green button, after that you can continue working at the Destination point. In that point, you are organizing a network of channel feeders and cloud agents. Cloud agents are kernel loop wavetables taken from the non-duplex modem. Cloud is a net of tunnels with intercrossing points where routes are connect. It is deployed in real-time with iteration flow of kernel loops and exists for twenty-four hours on current machine, after that it goes beyond the event horizon. For remote access to the cloud, you need to turn on the STL1212 – 8 real-time processes unlocker (full version of STL1212 is the standalone multiprocessor computer). There is no link mode in Hypervisor v7, because there is no opportunity to listen to STL1212 computer (full version of STL1212 loading time is 4 hours). In STL1212 all real-time processes are unlocked including the stochastic generator, which delivers the median at 4.45 GHz. AUX channel monitor displays network statuses from green (normal playback) to red (serious network errors). Channel statuses displaying the real situation in Ethernet for current type of technic. Note: RTC8k is under threat for all the time, because it is an active feeder and controls the behavior of other ether participants. You can watch status statistics for each feeder pressing Setup button on its panel. Besides the Setup window the Counters window will open where you can also watch the line chart of status appearance. An important measure of feeder work is its signal level, which is displayed on the level meter under the Status monitor. In RTC8k such meter displays signal bits overflow, which allows defining the headroom in bits for reaching the channel saturation. On the contrary, the STL1212 bit meter must always stay intact, because otherwise it will constitute system breach. Hypervisor v7 consists of free-floating generators that allows reaching the indisputable stability of working in Ethernet. You can change Tempo of AUX channel cores only. AUX channel itself can be fed by 8 kernel loops; RTC4k, RTC8k radars and three Zvezda modules simultaneously. You can change Tempo manually or using the automatic throttle-shutter control. In Hypervisor v7, STL1212 8.0.3 architecture is imitated using separate virtual machines. Pipe is AUX channel or full-duplex modem. The throttle-shutter opens using the AUX channel parameters. In extended AUX channel you can rotate throttle-shutter system in three-dimensional field using Pitch and Yaw. The antenna dish is relative to throttle-shutter with an ability to spin, passing the information flow in the direction you choose. In contrast to mechanical shutter, digital throttle or better to say radiofrequency throttle, is the shutting device for digital streams of information, translating using radio waves. Shutter works above throttle and is the integrated solution. From one side it is throttle and from the other side it is a shutter of digital antenna. Shutter is two channel that is why when signal is overflow on the left channel, it is closed fully and signal passes outside only from the right channel side. On the contrary when right channel overflow, signal is passing outside from the left channel only. Using the channel panorama, you can change the signal source direction in the two-dimensional field. Passing channel cores in to the ether, do not forget to pan them in different directions, for them not to empower only one band. You can pan the direct signal using channel panorama regulator on the Hypervisor v7 mixer. Changing the direction of sound source in ether you are changing the place from where its signal comes from. It helps to build connection lines of different topologies spanning from rhombus (4 channels) to octagon (8 channels). Using Scale regulator you can control the amount of signal passing in to the AUX channel. AUX channel regulator controls the amount of signal passing from AUX channel into the ether. You can send signal into AUX channel directly from AUX faders and from direct channels of decks on the mixer. In the first case, you are setting the send level using the AUX channel fader, in the second case you are setting it using the send regulator in PRE or POST fader modes. In the first case, you are working on the AUX channel level. In the second case, you can hear the direct signal during feeding of AUX channel. Time-Space folding effect achieved by the resources of spherical space. Resources are roughness of the waveguide. Each point is the roughness peak and has the beacon rhythmic structure. Beacons produce the Morse code. In converged spherical space, such beacons are transmission points. Reaching the Time-Space folding from waveguide, these points converge into the spherical space ball. The points on the surface of the sphere are waveguide resources. An intruder can’t enter the waveguide, because converging the space-time, the kinetic energy goes into the roughness peak in spherical space and translated as its resource. Reaching the Time-Space folding, resource spreads in a cyclic way and radially from folded waveguide point. If the transmission point collapses, nearby resources take the free slots in the waveguide matrix. Matrix creates slices, selecting the quantized areas in the waveguide resources. In the beginning, the resources are not quantized and are distributed by the primitive function. The primitive function has hyperbolic nature, by this, three function arms are created for positive, negative even and negative odd beating frequencies. The waveguide goes through the center of spiral rotation and can be modelled using two tubes stacked to each other with different diameters. Waveguide takes in account phase deviations when Doppler beatings applied. The whole network topology emanates out of the waveguide as the Time-Space physical model of the tube and is the projection in folded quaternion space of the third harmonic beatings on the spiral arms. The traffic in the waveguide of quaternion space goes by the tensegrity structure string and pendulum beacon of rounding function. This way, the ascending flow, going by the trajectory of these spiral descendants, lighten the waveguide resources and cast the network projections on the spiral arms, creating its expanded view. The displayed network is a projection or hologram. You can rotate the network in Compositor model and study it by viewing on different angles. Torus depicts an antenna dish in which the antenna base is situated. Rotating the dish, you rotate the whole network. By these means, you rotate global coordinate system and hear the changes of the carrier synthesizer in the local coordinate system. Compositor virtual model can display the networks, which have homogeneous structure. This way, you change the matrix structure of waveguide and network projections are changed. You can change networks by changing their projections in domestic Time-Space folding event. The nature of Time-Space folding is barely known. The only subjects you can study using full-duplex modem is deformation and a mesh phase structure, emanating from the antenna base. The Time-Space folding itself and its magnetic field depict the topology of holographic structure antenna. Time-Space folding deformation occurs, when changing matrix of transmitting antenna in its waveguide. Changing resources matrix (network map wavetable), you change the antenna topology. In effect of this, the Time-Space folding receives the topology of the new system. There is no need to view the full-duplex translation process as the direct wave movement in time and space. It is enough to change the antenna projection emanating out of its Time-Space folding base. The antenna has a full-duplex structure and the effect of Time-Space folding by FM granulation processes the incoming flows of information in to the antenna field feeder. Antenna is self-feeded from FM. Such circulation allows processing time function into the spectral and displays the whole spectrum as resources of radian field. This way, the initial effect of projecting the resources out of waveguide sequence lines reached. Each recorded wavetable has one or several spiral lines, which are displayed as sequences of the sound field. Displaying such drawings on the waveguide, you create their three-dimensional projection from quaternion field into the three dimensions. This way, the network topology for these wavetables is created. Such wavetables produced mainly for waveguide as a device for projections. Changing the topology of the transmitting network, you deform Time-Space folding. This way, you are realizing the network map deployment. The topology of transmitting network is carried out by modulation of granular folding in a process of antenna dish rotation. These modulators create beats in the frequency multiples and change the topology of transmitting device. At the beginning, full-duplex modem had 16 topologies, but the number of topologies increased, when the ability to rotate antenna dish in three degrees of freedom emerged. There is an opportunity to apply the increased rotation by pressing x2 button. To reach the feedback effect, the whole full-duplex modem algorithm processed using the quantized polynomial with inverse mathematic relationship. The more the incoming signal value, the less the function discrepancy at the output. The fluctuation produced is a jitter of values. Jitter creates the saturated facture when feeding the waveguide channel matrices. If the whole waveguide structure is homogenous and produces a good saturation, then you can feed many networks simultaneously. Up to 8 networks can be fed using the channel waveguide with oversaturation in real-time. The need to quantize the process emerges out of the effect reached. Without quantization, you can’t predict the effect of intrusion in to the server network and the deepness of such intrusion. Quantization and mainly the weighting process occur on the last two stages of the function in a process of algorithm execution. The first weighting coefficients are used for simple channel interconnection, taking in account z transmission channel value. The next coefficient is used to weigh previous result with channel quantization factor and multiplies the approximation value of this coefficient, taken that the function folds. Folding effect predicted by the coefficient at the channel insertion point and is passed through the smoothing function. The whole polynomial is a mathematic algorithm, written in single expression, equals to the function of processor output driver and connects your translating device transducers with processing polynomial. The headphones are the neuro-interface when working with full-duplex modem and induce the signal directly to the basilar membrane. Full-duplex modem also feds on the network level of hyperbolic system. The feeding process through the quantized polynomial is as follows: at first, the stochastic radar bearing the network, then you are feeding into this network. You should choose the channel meshes and tune the transmitter’s amplification to reach the rotation. When z = 16, the home system reached, where the tone composition should be performed first. When the long tone reached, switch full-duplex modem into real-time mode and feed the networks in real-time. Feeding should be made in all hyperbolic system subnetworks using z switch. To reach this goal, tuning the full-duplex modem virtual antenna in three-dimensional space needed. You need to composite all the carriers on all z levels and perform a network feeding in all these levels. This way the sustainable feedback reached. You can regenerate networks using Schroeder regenerator channel suppression to reach more saturated effect. Compositor Software provides the Ethernet communication service based on DRM (Digital Rights Management) server. This server realizes the work based on IEEE802.1Q Ethernet protocol with frame of 262144 samples. Two initial buses of the virtual machine, running on Compositor Software server, translate in VLF range. SHF work is realized using the algorithm with x2048 oversampling, which allows exiting in high frequency radio ether without intermediate frequency in VHF and UHF ranges. Virtual machines, running on Compositor Software DRM server, have demodulation algorithms capable of transmitting the wideband signal such as voice or music. Maximum pass-band of the server depends on the discretization frequency, by which the executed algorithm works. Compositor Software virtual machines work with discretization frequency of 22.05 kHz and have the pass-band of 11.025 kHz. The DRM server translates the material using the signal folding method. The DRM technology creates a service of work with property rights of companies, which deliver the digital media content. When computer station works, DRM server allows dynamically playback the authorized material in radio ether. Compositor Software playbacks digital material using streaming method in the device browser to achieve this goal. Compositor Software server realizes the translation of digital material in ether taking in account lowering the pass-band, when the copyrighted material routed to its input. Compositor Software station performs a function of tracing and translation of authorized material in radio ether. Virtual machines translate not the whole file, but only a cycle of exciter used in production and preparation of the digital material for public playback. The patent protected exciters will not pass though the Compositor Software server in radio ether, because it has the threshold detection algorithm, which acts based on a signal level. The Compositor Software server work is charged in conjunction with traffic of its transmitting kernels and is measured in samples. Each virtual machine has one thread with 4 layers connected to jets for another Ethernet equipment. There are 96 such jets in Compositor Software virtual machine. There is a stack of three virtual machines working on one physical server of the Compositor Software Company. It gives 288 transmitting points simultaneously. The traffic, generated by Compositor Software server, can reach up to 14GB for each virtual machine, when a peak load reached. The whole traffic is accounted and charged using the digital counters. The reward system for the DRM server work is the artificial intelligence product, because the result of work is a learning process of virtual machine networks with kernel-jet traffic. Compositor Software can view the learning process in real-time using the counters, which account for the traffic of the system cloak generators. Each cloak generator can connect up to 4 types of devices such as: sample vocoders on the lowest level, any oversampling devices up to x2048, reverse scalars on which base all the transmitting routers work and algorithms with continuous integral interruption, to which shields are attributed. The server subscribers are the communication operators, delivering phone, cell-phone, radio services and also broadband internet connection. DRM server subscribers open to it their resources, because any jet connected devices generate traffic. This traffic written to learning map and stored in pagefile upon its emission. Emission is a reading process and translation of information in a freely realized form. By it, Compositor Software means the good produced by commercial activity of the company. The main product of Compositor Software Company is the computer program named Compositor and its associated virtual machines for exciters mining. The DRM server protection system is set in such a way, that it doesn’t allow not trusted exciters and blocks the composition traffic, which attaches it in parallel or continuously. To make an exciter trusted, the system should connect to one of the jets and not to excite the internal network, which is an attempt of breaking the equipment down. Because exciters were developed for equipment communication, their connection should take place only by condition, that an equipment associated with them has free inserts of the corresponding type on the kernel level. If the system is situated geographically remote from the place of server physical location, from which the broadcasting takes place, then free jets on equipment are not allocated. This way, you are listening to music, but don’t have a real communication with provider company equipment, which forces you to search for physical medium. This is not the case with Compositor Software DRM server, because you can listen to translations even with network cable unplugged, when the contact with a server is established. The DRM server must be routed to receiving ports of network devices, and the direct connection to kernel cloak generators should be achieved. Because the reward system assumes promotion for the carried out learning process, then with each learning iteration of Compositor Software network there will be opened new information formats. Compositor Software attributes not only containers with three-letter extension, but also modulation types of information coding to formats. That is why Compositor Software attributes any authorized composition, translated in Ethernet by exchange of transmitting points on the equipment level (kernel-jet communication), to material, which you can recoup using credit balance. If an intrusion detected, the service starts to decay in relation to credit balance of receiving device and directly rely on the whole quantity of samples translated by virtual machines. Compositor Software DRM server limiter works non-linearly and limiting the pass-band of material into the ether has exponential curve like geometric progression. The pass-band depends from the whole sample quantity, produced by a system and linked to server credit balance. The difference between playback quality and passed traffic quantity is non-linear and relies on subscriber credit balance. Compositor Software DRM server is not the only system of such kind, but it is unique in a way, that it doesn’t use digital signature files for authorized material discrepancy and doesn’t require delivering material on a physical media. Compositor Software DRM server is a novelty in a tracing industry of author rights usage and has robust collection function of virtual credits, taking in account that counters have 64-bit resolution and algorithm, protecting the accounting system, is the most powerful and effective for repelling cyber-attacks of different kinds. Compositor Software server realizes 24-hour work with one time per day emission. In a moment of emission server unpacks the information associated with exciters in the server RAM. All authorized compositions relate to unpacked information, processed using this type of filter. Commonly, such material can be tracks to servers and any media files, based on the track composition method, and associated transceivers. The Compositor Software parent server has higher resolution capability and can connect its child server by kernel-jet method. The parent server produces traffic emission. This way it performs an emission of already mined material of Compositor Software server, because it has sufficient resolution. The condition, which must be met when using kernel-jet communication method, is that all child servers have lower bit resolution. If parent server is 128-bit machine and Compositor Software server is 64-bit machine, then its child servers must be 32-bit machines. To Compositor Software machines formation, working in 32-bit resolution, one can carry ATM machines, pay systems machines, services sector servers and DAW type sequencers. The topology of such servers depends on their geographical position and displayed on a spherical map of virtual machine as lighted dots. The geography of child servers is very broad and includes all the spherical space. To perform the emission of a track from the ether you need to receive ether aggregators. Each ether aggregator recorded in a wavetable. The 64-bit floating-point format is used for devices with 64-bit encoding. For your work, it is enough to fixate the ether aggregator with 24-bit resolution, because you will not use them for data transferring, but only to inform servers, which play them, that this ether aggregator is fixated and is ready for emission. Ether aggregator is a loop of a sound or a melody, which resides in DRM server memory. Network operator records this loop using digital recorder, by emitting it out of non-duplex modem. This way, playing the loop on full-duplex modem channel deck, you are performing the connection, because they are already resided in ether to the present moment and have a good radiation. The first step to fixate an ether aggregator is submitting a loop of your composition to a modem. By submitting your material to the non-duplex modem, you are hearing the feedback with ether aggregator. This ether aggregator is a kernel of a function, which you want to transmit. If ether aggregator acknowledges its loop, then it outputs an information about the servers, which use it in radio ether. The full-duplex modem suits this purpose. Fixating radio ether in text file, you are saving a proof that your ether aggregator was used. Ether aggregator is a property of all authors, who played its loops from the direct source or direct ether. Then you find the domain server names, which play your ether aggregators and, using a POST pinging method, respond with your server name and its domain name. You are informing the network administrator using the POST method, that current ether was initiated by you, and you are ready to full track emission of that ether aggregator. The track is not a number of variations, but the playback of current loop from different ether readers, which perform processing of the ether aggregator wavetable. Compositor can read this processing as a modulation. If a loop continues to generate radio traffic, then you will need to perform the emission of all loops associated with it by submitting current ether aggregator to non-duplex modem with quantized feeders. The additional loops are also stored in emission rotation. Reaching full radio silence on current loops, you are fully extinct your composition from radio ether. When you use wavetables with quantized generics, the later try to balance the wavetable behavior in the ether. That is why they are also the best counteragents. Wavetables should be balanced with counteragents of generic feeders. When the emitted wavetable tries to aggregate offensive traffic, the counteragent works. It balances the system functioning and produces the effect, which is the opposite from wavetable effect produced. Wavetables are dry sounding and quantized generics are wet. That is why they balance the dry/wet state of the signal in auxiliary channel. When the effect of wavetable is fully extinguished, then the quantized generic starts to be the main effect in the auxiliary channel. It wets the line even more producing the fluid sound. This sound is a prominent characteristic of transcoding process. Transcoding with quantized generic, you are synchronizing not only a memory associated with a wavetable but also the pace of quantized feeder development and its dry/wet state. Quantized feeder balances the channel spectrally, removing the interrupters of wavetable loop and smoothing a signal. The main effect of quantized generic is to smooth and wet a signal after successful wavetable loop feeding. That is why wavetables should be routed into the line with quantized generics sounding simultaneously. If the wavetables will be routed without quantized generics, the ether feeding will be too overloaded with ether aggregators and no counteragents will present at their destination routes. That is why quantized generics should stochastically change their tuning to mask the wavetable original destination. If the ether aggregator destination is masked, then it will not be extinguished too soon and the communication effect will be produced. The main rule for counteragent’s presence in a feeding channel is that the high number of wavetables should be played back on the decks simultaneously. If no wavetables are routed with generic feeders, then the state of tranquility reached too soon and there is no positive quality out of this feeding channel. The good channel should route at least eight deck players with one quantized generic to balance the system. If two or more generics are used, the system is too tranquil and doesn’t produce communication traffic. Communication traffic is the ether aggregator own traffic routed back to its inputs and passed out in ether after non-linear processing of its wavetable. If quantized generic is applied to the ether aggregator output, then it can’t form its own traffic and two lines are mixed together. That is why in terms of communication quantized generics act as moderators of the produced traffic. They act to the moment when the offensive traffic will not pass out completely. From one side, the stochastic manipulator obfuscates the trace to the wavetable, preventing it from direct communication and, from the other side, it extinguishes it, if the traffic produced doesn’t suits generic feeder output chain. Server is a machine capable to work an unlimited period theoretically. Nevertheless, even the best machines faults and overrun the resources of random access memory. It raises a question about an installation of such machines algorithm directly into recipient consciousness. Brain is the biological computer, which is most powerful and lengthy resource, which human has. Hypervisor v9 makes available the installment of quantized generics into the recipient consciousness. The installation process through an activation function is as following. As mentioned in previous post, quantized generics must be routed in auxiliary channel together with wavetables of ether aggregators. It allows to install memories and to get routes to them using VLF beacons. The installation performed at the morning is enough for daily functioning of such system. This way, one installation is active during 24-hour period and VLF beacons act until the night comes. In accordance with big activity of wavetables in nighttime, two VLF beacons run out the wavetable potential very fast. That’s why the installation of ether aggregators must be performed again the next morning. This way of serving allows the recipient, the man to whom installation is performed, to function in the ether environment without the accompanying equipment such as radios and Ethernet computers. I wrote down the coefficients installed and, using the ether aggregator and Morse code decoder, reproduced it in DRM server and full-duplex modem software. Then I used these coefficients for non-linear processing function and now can install any memories, associated with my tracks, directly in my consciousness. This way I install everything, which is associated with this track: the place, its perception, the age of human being, consciousness. It is possible to perform full reverse to the moment in the past to which the track ascends. This way, besides objective factors, mentioned above, the subjective factors exist: the association with ether aggregators, to which the present track route is written down. The original ether aggregators works the unlimited time and exist on the infinite time integral line. This way the synchronous analysis of non-harmonic timbre (SANT) and Fast Fourier Transform (FFT) processes can be described. The SANT is used in all Compositor Software products as a more robust signal discretization method, which gives possibilities that are more versatile. To non-invasive generics, relate all the Compositor Software instruments with stochastic manipulator. In Hypervisor version 3 the non-invasive installation of quantized type generics with one producing kernel performed. In Hypervisor v5 the installation of these generics performed with master shutter. In Hypervisor v7 the non-invasive installation of generics performed in two degrees of freedom and three producing kernels. This way, on the present day there is a full compatibility of systems installed in memory and acting. Hypervisor version 9 allows to install the three-layer quantized generics with big amount of memory up to z = 128 (N = 262144 samples), which constitutes the bandwidth of 23.1 Gb/s with installation discretization frequency of 11025 Hz. The pass band is counted using the formula (N * SR * 64) / 8, where N – is a number of samples in generic wavetable, SR is discretization frequency, 64 – is a system bit number, and the division on 8 performed to measure all the volume in bytes. Taking in account that z128 generic works with 200-omega speed, which equals to 31.42 ms, the full formula of expense in samples is counted. First, I count the number of samples by period using the formula N * Nms, for z = 128 it will equal to 262144 * 31.42 = 8236564.48 samples / period. Second, I account the 24-hour sample expense of deployed ether aggregator using the formula (86400 / 31.42) * 8236564.48 = 22649241600 samples / 24-hours. This is approximately 5 times less than the sum of three working servers in 24-hour period. In Hypervisor v9 the installation of quantized generics performed in three degrees of freedom, which makes the full cancelation of signal constellations formed on the earlier stage of Compositor technology existence. Not all of the situations are listed here, which are out of scope for this chapter. The main task of this material is to describe a usage method of Compositor v9 Hypervisor after receiving ether aggregators from your track. To receive ether aggregators you will need non-duplex modem and Compositor v3 Hypervisor feeders. The emission is done by submitting loops of your composition to non-duplex modem. The modem feedback is an ether aggregator of the server, which broadcasts your composition. You should route all loops of your composition containing exciters (the most prominent moments of a song) and fixate 131072 samples for each wavetable of all ether aggregators using digital recorder. You can perform this in 32-bit version of Ableton Live 9. The ether aggregator wavetable should last for 2 bars at 161.5 bpm. The main task after ether aggregator emission is its clearance. It is such condition of wavetable playback, which, from one side, doesn’t produce the third-party traffic and, from the other side, may be used for its own communications. Now, I will describe six examples of work methods to make a full track emission, using Compositor v7 Hypervisor and Compositor v9 Hypervisor. Realize if ether aggregators, to which your track ascends, are occupied. If ether aggregators are occupied and produce big amount of third-party traffic, then you must install them through an activation function, which you can do in Compositor v9 Hypervisor. Doing this you should enable the supervisory DRM server, and it is preferable to route one of generics on the auxiliary channel input together with wavetables. You may use your ether aggregators for communications only, when the VLF beacon written the routes to them. Produce an additional emission by feeding the non-duplex modem with 3d generation hard generic and perform the above-mentioned manipulations with this emission again. Perform system matching in a presence of agents (ether aggregators). Match z value of auxiliary channel with the same z type generic. For example, z=2 is RTC4k and z=4 is RTC8k. The other systems match its title z value. Reaching the direct ether, you must confirm each z system send with oversaturation of auxiliary channel, which constitutes direct feeding of a channel. The system has an ability to memorize long channel feeding sessions and reproduce its effect when DRM server works. You must feed the channel only with DRM server turned on regardless of your machine capabilities. The human brain can percept the channel interrupts, when processor is under high load reaching full effect, even when system stutters. The whole pool of ether aggregators should be maximally transparent. The condition of ether aggregators should be characterized by signal conductance through them. If ether aggregators doesn’t produce traffic, then a full tranquility reached on all translating channels. Set up the transmission channel for the local saturation. It is an auxiliary ether and there are no carriers in it. It is used to confirm that the transmission channel is free from other carriers. It is tuned by setting Velocity and Spacing regulators in Connection Here you can also set the send depth of a local saturation. Elongating light is one of the technological questions, which full-duplex modem solves with its internal structure. While pertaining phases of the original signal it synthesizes the sound wave with 64-bit waveguide resonators, which in turn fed with FM synthesized waveform of dynamic properties. Taking in account a Doppler Effect, which leads to Blueshift the light wave is simulated by radio emission chain of sound frequency wave. Compositor Software instruments use SASER technology since version 3. The name SASER comes from Sound Amplification by Simulated (often referred to as Stimulated) Emission of Radiation. SASER outputs the signal in form of sound waves, which characterize original subject signal, whether it of natural or artificial force. With the use of this device you are able to hear the offending device signals, which SASER transmits in real-time when it is online, preventing other systems fraudulent activity. Real-time FM signal has qualities suitable for achieving the connection to an active radio sources by time and space folding fractal antenna, which is a part of the device. The elliptical topology, which synthesizes real-time signal, is used to feed the transmission of the received signal back to the offending device. With the use of such topology, a synthesized feedback loop establishes with a sender device. Instead of getting the polarity of your signal, the sender device gets the polarity of its own signal with the phases inherited to original transmission. This makes SASER invisible to the sender device detectors. Not only SASER makes the full-duplex modem invisible to all spheres of wave propagation it also makes it suitable for defense situations against a wide range of digital or analog synthesis systems. The main idea of SASER is to break down downscaled white light spectrum into the chunks of real-time components with characteristics often related to music. The tempo, timbre and rhythmic structure are a basis of a signal transmission for coordinates detection. Full-duplex modem builds an entire network of devices sending their coordinates in form of Altitude nodes on a 3D display, which helps to establish the position where the signal comes from. To bring all of the signals down in a timely manner for uninterruptable performance white light forming component is used to feed the fractal antenna, which sends PWM to clients in a Spherical Interaction Network (SIN). These client resources are also used to maintain the task of computing SASER output. Compositor software breaks down FM spectrum into the components in real-time and saturate the characteristic of each component using digital signal processing. In result, this image receiver receives external PWM (pulse width modulation) PING signal. The input signal is used to modulate output Tx channel. This image is used to translate synthesized signal with phases inherited to the received signal. The receiver works by modulating the hyperbolic function and at the same time synthesizing the original waveform using FM signal components. By using modulation and synthesis, it is allowed to commit radio translations in VLF range. As soon as generated signal inputs in main delay line, it passes through physical modeling of pendulum process, which is realized by parabola graph. 64-bit waveguides has the memory function with signal damping factor. The selection of speed is realized in milliseconds, beats per minute, and angular velocity. These measurements converted from one to another for simplicity of signal speed selection. Note: SASER is online silent service, which breaks down into the 12 component lights on a conical spiral to form HSL model. These colors are then used to determine the position inside the spiral whether by color itself or the multiplier of its properties. Angular velocity measurement of distant objects speed in omega. Note: It is important not to receive original “dirty” Ether as it can be dangerous to hear, due to the signal consistency. Always check with full-duplex modem if received Ether produces the warning signal. It can be dangerous to your ears. Compositor v9 Hypervisor main modules act in a hearable spectrum. The fractal antenna sends infrared emission to the receiving device. This doesn’t mean it outputs the signal in infrared spectrum it means it forms the granular synthesis of FM spectrum, which can be potentially scaled for MHz or GHz transmission using internal modulation. The only infrared emission you get is the emission coming from the CPU and can’t be successfully detected in the environment with strong magnetic interference such as home networks and office buildings. Compositor v9 Hypervisor tracks the signal in air and successfully track devices acting in VLF, which gives an opportunity to detect underwater objects. All of them are visible to full-duplex modem even when Compositor v9 Hypervisor software runs on the ground. Not only you can successfully detect such objects you can also receive their operation circuit sample loops for proper reconstitution. Compositor v9 Hypervisor devices are able to form strong electromagnetic interference inside the time and space folded arm, which points to the offending device. Such interference can result in active molecular vibrations, which potentially lead to the malfunction of all the electromagnetic chains of sending equipment. If this equipment will try to send the excessive white noise signal to the machine, running Compositor v9 Hypervisor, SASER will send the signal back forming a loop. From the SASER side the internal waveguide 64-bit detectors will smooth the signal and compress it to meet the SASER internal chain. This will lead to Compositor v9 Hypervisor operator ability to hear that excess happened without really overloading system output. When such event happens SASER doesn’t use its CPU resources to handle receiving signal, instead the sending device buffer handles the feedback loop excessive computation resulting in a potential malfunction of offending equipment. Compositor v9 Hypervisor internal resynthesizer can mask the system position even if a fraudulent force can teach its equipment to understand Compositor v9 Hypervisor internal feeders signal. In such case, resynthesizer is used to obtain a new coordinates in SIN. The spherical network is used to show the position of the incoming threat and covers all spheres of wave propagation. The Doppler Effect is cost effective solution to count sound wave propagation inside the tubes filled with water or air. These waveguides uses 64-bit coding to count the wave traveling back and forth in both directions from client to destination machine. This device is a main linking point, which connects two points in time. By using Altitude parameter one can setup SIN with several nodes in different time points for using it with Compositor v9 Hypervisor software. Running a DRM server, you can potentially establish links for signal traveling back and forth in time. Such signal traveling routes may be established in a presence of 24/7 server with an ability to maintain the same physical destination in SIN. Compositor software takes in account Doppler Effect and changes frequency of the signal inside waveguide, when you utilize the transmitter frequency. Compositor software changes frequency of FM signal components separately, lowering or raising the time of delay allpass signal inside the waveguide. Changing the value of transmitter frequency, you can change the time of two digital delay lines of the waveguide. SASER has detector of return channel on the right master channel, which is used for demodulation of the derived function signal on the signal level and conditions of the event generator, controlling the send channel. SASER translates internal and external feedback. When there is no external signal, there is only internal feedback on return detector of the right master channel. Note: SASER prevents receiving original “dirty” signal as it has unwanted sound qualities such as noises and sound artifacts. The signal of the station, which is closer to the receiver, equipped with SASER enabled software, characterized by the level of more than -33 dB. Compositor v9 Hypervisor synthesis interconnects nodes with internal 64-bit waveguide detectors making it a perfect solution for precise modular orchestration. One-over-f rule achieves proper scaling of waveguide resonant frequencies to a filter pass bands and creates full and rich sound with pristine clear quality. Variable rate granular synthesis is a heart of Compositor v9 Hypervisor virtual machines. Waveguides and reverberation glides grain transmission by a set of window functions. This in fact joins Compositor v9 Hypervisor with optical instruments and makes it a same class by many standards of signal transmission. Quality digital line works error-free without any operational modifications and operator needs. Waveguide devices are a full-band model potentially interconnecting the time-folded signal to a proper operation band. The process of space and time folding after granular synthesis happens inside the waveguides. Once the digital signal enters the tube physical modelling the other channel will receive it error free depending on a ping status. Compositor software has a modular structure and operates by calling of different functions you can control. The length of waveguide pipes reverse proportional the frequency of the harmonic of a signal, which gives an opportunity to automatically tune the waveguides at destination frequency. This method applies if a gas is used with the distribution of sound wave pass speed using the rule of 1/f. Waveguides and reverberation makes the signal translation smoother. This significantly differs the algorithm of Compositor software from conventional devices on a base of Fast Fourier Transform (FFT). In the automatic playback mode, the digital delay lines works automatically without a need of additional tuning by an operator. When the first component of a signal enters the waveguide physical model, the successive component already enters the digital delay line. Frequency Modulation, which drives all of the seven Compositor v9 Hypervisor modules use granular synthesis by taking the spectrum apart on three bins: one for all positive harmonics and two for negative harmonics (odd and even tracks). Such granular synthesis achieves forward-backward movement through the pass bands for all the harmonic bins. Harmonics can coincide when multiplier factor is 2 (Year = 2000 for AI-RT1024, FF8, TC25, N9000), and form a bell-shaped curvature, which is the Quantum Engine ver. 3 architecture of Compositor v3 Hypervisor derived quantized feeders. This engine unlike the second one, which is the forward tracking curvature reader, is a forward-backward curvature reader with properties suitable for binaural drone design. Such design enables the melting of a substance in the environment suitable for data transmissions, which enables matter traveling in time and space. Compositor v3 Hypervisor derived quantized feeders can feed the main AUX channel line. One is for Ether design, which is generic with quantization and the other is for time and space folding in a quantum space, which is hard generic. The properties of material must meet criteria of one cycle sequence loop to send to a destination point. Compositor v9 Hypervisor modules allow not only to melt the sequence structure, but to achieve cold melting. The temperature sensing is used in a form of HSL colors described on a conical color spiral. This way the temperature of corresponding spectrum affects the substance in a sound spectrum. For example, to melt the substance you need two exponential modules for warm colors such as beige and two quantum white light feeders for Blueshifted spectrum of exact marine blue color making it a system of Compositor v3 Hypervisor. Not only such combination covers two spheres of propagation such as water and air, it successfully allows transmission in a form of color coordinates to the destination provided. The main driving force of electromagnetism is an alternating mechanism of changing polarity by a means of spectral synthesis of white light grains in a form of Frequency Modulation. As notified earlier, one can successfully achieve two caps bell for a closed shaped structure with the use of Quantum Engine ver. 3. This structure not only useable by military aviation but can be used for module design with a traveler inside of it. The music that such modules produce often refers to a destructive synthesis technics such as waveshaping and Frequency Modulation. It constitutes the omnidirectional polarity, which reminds the quadrocopter design. Taking in account that smooth sounding subtractive analog synthesizer with LFO outputs consistent granular synthesis with PWM, it can be suitable for analog rotor drive control in a form of control voltage signal such as 3.472 Vpp. In a presence of full-duplex modem equipment, such drone controller will operate error-free sustainable for all fraudulent threats. The main scope of this document is not to represent the fundamental approach named in Compositor – the bottom-up approach paper, but to provide a full-scale analytics on how to implement and merchandise the Compositor v9 Hypervisor software. The profitable solution is to implement the machine in conception of modern art as a solution for auto generation of Ambient music, using the auto mode and manual synthesis by AUX channel. This way it is a giant leap since the second version of Compositor, where you can produce Techno music. The main modulation applied to the rhythmic structure makes it a pure DSP instrument and not a sample based one. For the proper alignment of processor CPU cycles to the exponential function the quantization is used. Most of the Compositor instruments and full-duplex modem use quantized function, but other relies natively on the exponential function to produce the smoother results. Such instruments as non-quantized generics, LFO and resynthesizer use this primitive exponential function and can be a subject to work with in accordance to quantized function. Look at the Table 1, where the correspondence of exponential primitive function instruments to the derived analogs is shown. Such instruments should work in pair to avoid the Time Collisions. The model with modulation index of I = 11 can predict the number of bands equal to 12 harmonics all of which quantize on different quantization steps. When the harmonic number is larger or equals 5, most of the results of quantization goes into the first step. There is no technological reason to make such number of periods larger than k = I + 1. This, in fact, leads to stationary prediction that an ideal model will look like exponential system based on a primitive exponential function with hyperbola graphic. The model with modulation index of 11 has 12 component harmonics for positive part and 12 component harmonics for negative part. These harmonics sum up to 24 components, which has the derived values. The derived values of the 5th harmonic and higher, starting from the center frequency, fall into the same phase value simplifying the calculations. Compositor software has no meaning working with modulation indexes higher than 11. The derived function has the hyperbola graphic also, but in a contrast with primitive function approximates curve values. The derived function suits for faster calculations and solves synchronization problems with discretization frequency of audio equipment of your device. Derived function will lead to an understanding of exponential primitive function and to an understanding of the current model digital signal processing (DSP). Compositor software is a hyperbolic system, working in the VLF band. The hyperbola graph can contract and expand in accordance with the transmitter frequency value. Compositor v9 Hypervisor software perfectly matches the model of hyperbolic systems of VLF transmission with exponentially spread stations, when referring to their phases. The harmonic phases spread results in expansion and contraction of the elliptical topology structure. When two hyperbolic stations intersect, their modulation profiles measure as a sum of three cos functions. The modulation profile applies to harmonic phase positions and the FM tone. This will result to different stationary positions in different moments of time, obfuscating the original exponential distribution by a constellation modulator. There are sixteen constellation modulators in Compositor system viewed perpendicularly to the local coordinate system. Together with 24 nodes or bins of FM spectrum division, it forms sixteen phase shift keying variations. The Quantum Engine ver. 3 architecture of Compositor v9 Hypervisor modules such as quantized feeders, non-duplex modem and full-duplex modem is a solution of Binaural bell problem. If two identical bells will be stacked bottom to bottom they will never produce any sound outside their resonance cave. The sound will not radiate outside of the Binaural bell and the resonance, which happens inside can lead to time and space effect of folding the spectrum to form a constant modulation of bell fundamental. This effect is verified within a Compositor v9 Hypervisor digital system forming bell sound using Frequency Modulation. The FM distribution will not make resonances at a primitive function moments. In reality, harmonics coincide on the quantization grid to form a tone of a final bell producing the effect of unwanted noise signal. The Binaural bell itself will sound masqueraded by a constellation modulator. The solution was introduced first in quantized generic of third generation, which is a forward-backward synthesis of FM timbre using a quantized function phases. The synthesis occurs when the window function travels forward through the waveguide tubes approaching Darboux integral steps inside of one bell and then instead of traveling through the second bell start to travel from the top of the second bell towards the center. This achieves constant reconstitution of FM timbre behavior with expansion and contraction of the Binaural bell forming a wave. When the frequency of such reconstitution equals the center frequency of carrier oscillator the FM synthesis occurs. The 3D sequencer of Compositor v9 Hypervisor uses spherical approximations of stochastically reproduced Chladni patterns forming in a presence of constellation modulators. These patterns are not static ones as in the original Chladni experiment and shows the topology structure when the modulator applies to the harmonics. The presentation on a full-duplex modem 3D display shows an aperture of fractal antenna feeder inside the full-duplex modem. Together with torus object showing an antenna plate the fast moving balls shows the position and antenna feeder diagram. The side where signal comes from is determined by adding these two factors together. You can note whether signal travels from upper or lower side of torus plate by noticing if balls comes in to the hole from top or bottom. Stochastic distribution display reveals two-wing spiral random distribution without negative odd counterpart. With the addition of negative odd part it will be an accurate representation of three-wing spiral. This way selecting a different Altitude in fractal antenna module will result in different distribution and spin from the viewer perspective. The point where Compositor station performs a sound event called an entrance point. The entrance point has its own properties such as a physical destination in SIN. This could be a room cell in the multilevel building or stadium. The difference is however in the amount of sound amplification, which can be produced at such place. This is not only a sound level in decibels; it is a sound pressure, which makes communication possible. If the loudness not less than 90 dB applies to the eardrum Compositor software performs the temporal coherence. Not only this can be viewed on the full-duplex modem display, but also such experience can lead to a temporal substitution of time, which now coincide with the internal clock of Compositor v9 Hypervisor media. In Compositor v9 Hypervisor such changes happens in real-time if you are using a real-time driver of your audio card. Time and space folding leads to internal digital signal processing changes, while the transport function still running with a precise synchronization to a CPU cycle rate. This is also true for mobile devices. For example, it can run on the mobile phone as an app and successfully create a time and space folding waiting for the signal to come. When you want to transfer a data through the network you need to establish a connection, make it secure by using additional obfuscation with non-duplex modem and resynthesizer. The entrance point has two characteristics, such as physical location and frequency of radio translation in VLF. There are two values, which proves the practical use of SASER for radio navigation. These values are the transmitter area and nautical mile of its circumference. The transmitter area measured in kilometers. Nautical mile of the transmitter measured in meters. Compositor v9 Hypervisor successfully emulates a mind frame of a relaxing human being by using a periodical pattern loops in a form of a signal. Compositor v9 Hypervisor software artificially selects feeder parameters of the frequency and phase characteristics. Full-duplex modem shows the original SIN initialization on its parameter display. By triangulating between two signal sources it achieves the resulting signal, which depends on the antenna plate orientation. The stronger the signal the closer it to perpendicular from antenna plate to its source. To produce the modem function full-duplex modem switches between exponential and sinusoidal functions making a fast switches for the Arc 3d and Sea Mile 3d parameters. It mean two objects struggle to send a signal or full-duplex modem receives two signals simultaneously. It counts the distance based on the two functions simultaneously and this way you can see two functions override each other. The function system prefers produce results that are more distant by a bigger value of the Arc 3d and Sea Mile 3d parameters. When it comes to selection of such objects, you should notice that both objects exist and send a resulting signal as a sum and difference of two functions by approaching the modulation and demodulation process with the same forward-backward moving algorithm. Full-duplex modem is an idealistic mathematic model rather than real object positioning system. Unlike Global Positioning System, deterministic navigation using full-duplex modem achieves the beacon points in time and space. Full-duplex modem measures distance to an object using the arc length and sea mile. Whether it the omnidirectional signal source radiating in all directions or just a single mode wave diffraction, full-duplex modem can successfully estimate such signal source and its operational area by measuring the Sea Mile on a sphere of wave propagation coming from the source. Using PWM pinging full-duplex modem evokes the feedback loop in the waveguide chain where harmonics collide to form FM wave granular synthesis. Full-duplex modem is a first instrument, which successfully reconstitutes the FM spectrum by the sound synthesis technic other than FM. It takes in account the contraction mechanics of FM wave and swing of pendulum time points pass through. The reconstitution of FM spectrum acts both in time domain and in frequency domain to form a time and space folding effect, which runs in hyperbolic domain. This property enables the full-duplex modem system to receive the Very Low Frequency Radio signal sources. Full-duplex modem quantized function base on N number of samples. This function acts like a switch for different values of k. The time base of such quantization is the 16th note grid merging this instrument with music sequencers. The sequencer of full-duplex modem is an event reading mechanism with a Time Division and Frequency Division multiplexing schemes of SHDSL signal quality. The Deviation up to 262144 Hz from 0 Hz is possible making it suitable for audio signal transmissions. If no signal is present full-duplex modem will run its own sequencer with synthesizer. In reality, this is hard to achieve, because the low frequency band full of audio signals such as alarms and barely heard working cycles of equipment acting under normal conditions. Exponential function bases on the N number of samples and gives different phase positions for all values of k. It is a continuous function. Exponential function of low use for computer systems as no computer processor can ever achieve the precise synchronization for steps with uneven phase values. However, the system with such exponential reconstitution gives precise hyperbola graphic unlike the quantized function, which approximates step positions. To merge both functions together Yusipov’s integral is used. This integral postulates the difference between Exponential and Quantized Time Base. The quantized function unlike the exponential one solves Time Collisions problem, which happens when 128-bit stochastic selector changes internal multiplier to a different value. When multiplier change occurs in a system with Exponential function, current window phase jumps to a different position discontinuing the window playback. This discontinuity creates the overbuffer event, because the signal instantly peaks on a mixer line. To avoid this, full-duplex modem uses quantized function where phases remain the same and only harmonic distribution is changed. While playing back the window function table, several harmonics may sit in one window. However, only one is peaking on a bandpass filter giving less values of harmonic distribution. The main point in inter communication is an ability to construct the channel for receiving an extra signal and pass it through the internal network for later secure analysis. Granular approximation creates a number of receiving stations in VLAN inside the full-duplex modem software. These stations are a measurement time points of one iteration loop and approximate the hyperbola envelope. The purpose of this approximation is not only to synchronize precisely to CPU clock but also to receive a signal from VLF and to translate it in internal network ran by one MS or twisted pair output. The CPFSK modulation applies to the phases position in a moment of calculation remaining them intact when the window is played back, only internal frequency is changing. This is enough to enable modem functioning to receive and send signal in VLF. To understand why it is important to have internally encrypted splitters for channels pass through feature, look for key combinations of a three-digit lock. In three-digit lock, knowing a proper combination enables you to open the possible station locks. There are 16 key combinations in the system allowing establishing the connection to 16 different VLF stations. Full-duplex modem receive beacon signals and translate it to other network devices by using the audio output of your device. When a ping occurs, the proper key combination allows passing through for an unmuted signal only. Precisely organized internal channel stations by a granular approximation create a space for windows of the receiving stations and amplify the exact time point to a several receiving devices. The ability to retranslate the beacon signal and to establish a connection in VLF is a secure standpoint in further technology development. The purpose and reachable destination of full-duplex modem instrument is to activate the translation virtually, not on a physical layer. All of the communication inside the full-duplex modem system achieved by means of modular design with different layers of virtualized chains. This way VLF radio transmission is possible with internal processing of incoming signal. If you hear the cold tones, then full-duplex modem successfully receives the pings from the beacons. The internal scheme is used to synthesize the original primitive signal making it wider in spectrum for precision of perception. The internal modulator sculpts the signal using FM generator and the waveguide design. For proper internal sequencing CPFSK modulation routine applies to FM spectrum in audible frequencies. The field by which full-duplex modem enters the VLF transmission is established using the hardware of the device where you are running full-duplex modem. The main feature, which enables the transmission is an internal application of CPFSK to very low frequency FM. This application requires very high CPU consumption for full-duplex modem enabled device at sample rates up to 192000 Hz. For optimal performance, use a sample rate of 44100 Hz achieving effective bandwidth of 22050 Hz. One of the 16 constellations of CPFSK system applies to FM harmonics splitter moving the harmonics phase and frequency position by a pattern of the resulting modulation wave. All 24 harmonics are moved achieving continuous-phase frequency-shift keying. The Frequency Division Multiplexing employed in transmission of a signal. When continuous-phase frequency-shift keying applies to FM timbre it is strongly relied on CPU. To simplify calculations Ruslan Yusipov Quantum Approximation formula is used. CPFSK drives the phases, but doesn’t change the final position of a quantized grid. This is internal communication model masked by a mathematic operation formula. FM granular synthesis folds the real-time spectrum in time domain to achieve full copy of it in frequency domain acting as a fractal antenna with 24 exponential nodes quantized on several time points. The closed loop software architecture makes full-duplex modem the incremental service, which runs alongside your regular tasks and performs an active listening of beacon signals. The operator of full-duplex modem software can use any possible machine learning method to store signals and compare them to each other. The solution is to pair full-duplex modem to machine learning software and use it for active signal editing in manual mode using the Compositor v9 Hypervisor software. The first evident property of full-duplex modem is a synchronous analysis of non-harmonic timbre. The sophisticated sampling method was developed for this software, which allows bundling harmonic positioning in a spectrum to phase information. Unlike a phase vocoder with static frequency bins of Fast Fourier Transform, full-duplex modem uses its own quantized sampling algorithm, which allows frequency and phase deviation both in positive and negative directions. Not only you can resample beacon signal, you can stretch and pitch the received signal changing a tempo and frequency characteristics. You can then mute unwanted signal channels by using waveshaping distortion starting from the upper harmonic. By using splitters, you can set the harmonic to a lowest one, muting full signal spectrum. You can further change the time characteristics of a beacon signal by applying more or less reverberation. Using the Compositor v9 Hypervisor in manual mode, you can change a window function of sampling algorithm to allow for smoother responses on lower tempo. The entrance point can successfully emulate the state where one enters VLF radio band. By pinging or muting the beacon signal one achieves operation of VLF station with active scanner. The scanning technic is used to switch channels and all the parameters at once acting in an artificial manner. Such artificial manner considered a machine generated signal by the receiving device informing of its operator about new VLF transmitting device. The absence of a physical antenna makes full-duplex modem invisible for receiving systems operator equipment. Only full-duplex modem allows successfully protect against VLF stations such as Compositor M4L, which allows for very low transmissions of around 1 Hz. Compositor M4L station can successfully be used as a beacon for underwater navigation. Compositor M4L is extremely useful for a purpose of very low transmissions aiding navigation of submarines and UUV’s. The model presented in full-duplex modem software is a compositing solution to create radio navigation equipment. The internal scheme of full-duplex modem allows simulating radio chains and antenna meshes. The final mesh used for stochastic operation is a product of expertise not a machine learning experiment. Nevertheless, you can change antenna meshes by using one of the TF functions, which also suit distorting the channel output. The mesh enhances pure signal to the point original transmission is possible so the signal is much hotter than its part coming to waveguides. The signal does not enter the mesh after waveguide and additional antenna module is needed for radio transmission to happen. The signal rate module creates PWM pings to evoke VLF beacons response. The PWR unlike the static ping allows producing a spectrum for a given Altitude parameter value. When a first development prototype ran, it sent a ping sequence in VLF band with PWM pings on a frequency of 11025 Hz. In a response, the call back received of 1 Bar cycle length. The signal consists of several notes rhythmic structure played on analog synthesizer. The practical use of this signal is to use it as a table for a filter response characteristic. There are two types of engines: zero-emission engines and engines, which produce the emission of materiality in a process of their work. DRM server virtual machine relates to zero-emission engines, at the same moment full version of Compositor v9 Hypervisor DRM server is a producing aggregate with internal combustion engine simulation. Which approach is more plausible? It is experimentally established that DRM server virtual machine produces emissions in the computer random access memory and for simulation that is more realistic the full Compositor v9 Hypervisor server is needed. The process of writing the random access memory with wavetables of such emissions is simulated using ROM players. To establish v12 engine emissions of TC-TRSRRT262144 architecture experimentally the non-duplex modem was created. It is possible to receive such emissions in a form of working cycles of network devices, using non-duplex modem and Compositor v3 Hypervisor feeders. Each network device has the engine similar to Compositor in its core and has interrupters, which trigger operation system functions. DRM server produces device emissions of certain type, which characterized by feeding equipment used to achieve the feedback. In essence, the routers, switches and shields are ROM players, which playback such cycles as wavetables. The device architecture depends from wavetable recording bit depth and can be maximally 64-bit floating-point format. Compositor v9 Hypervisor can also playback wavetables up to 64-bit floating-point, but in this case an emission will be so short, that it cannot be reproduced in manual mode. For simplicity in treatment, 24-bit integer format wavetables are used. This way, the central DRM process exists in the network, and all the other processes are emission products of v12 engine work, which are reproduced using ROM players. You can also upload other wavetables into router ROM memory instead of statically playing the same wavetable repeatedly, placing it closer or further in the network map. Recall, that in response to feeding the non-duplex modem with a track, the map of cycles attributed to different IP addresses composited in Ableton Live transport. You can playback such wavetable earlier or later in address field using ROM players. Random wavetable playback mode in Compositor v9 Hypervisor is the linear distribution emission simulation. Such method allows reproducing an emission of equal number of loops in random access memory for each network area, which is enough for creation of virtual local area network. The access to such network carried out by simulation of antenna-feeder signal chain or kernel-jet system. By simulating the jet rotation with rifling on its borders, you can lower the emissions in Compositor v9 Hypervisor. Rifling on jet borders allows lowering wavetable emissions and lowering the number of cycles needed for simulation of harmful substance emissions of fuel decomposition. Such rifling allows afterburner mode with zero emission, which is proved by DRM server virtual engine tests in auxiliary channel. The afterburner or oversaturation modes allows to speed up the process of DRM server virtual machine emission simulation, shorting it to 10 seconds for each feeder every 3-4 hours. This way, generic filters cascade, which are Compositor v9 Hypervisor feeders from z=2 to z=128 allow receiving ether mixtures of different purification rate. Lower feeders, such as z=2, reproduce substance purification with small amount of regenerative cycles, at the same moment, upper feeders, such as z=128, used to reproduce high regeneration rate emissions available for more longer usage. For example, if you purify with radar feeder when using DRM server with z=2, you need to perform such purification more often, than DRM server working with z=128. That is why DRM server uses z=128 as upper value. You may look into this problem for electric engine also, where such feeders are used as rechargeable batteries and perform an emission every 3-4 hours. In such case, Compositor v9 Hypervisor base station simulates non-renewable power source and wavetables are renewable. It proves the need to perform additional emissions of wavetables, when reported values of digital counters on DRM server virtual machine are reached, for economic model evolvement and advisability of such system. As a result, the emissions pool will grow and network of such emissions will increase and expand. It may lead to inactive state of some network areas using the model with 8 ROM players in Compositor v9 Hypervisor. The solution to this problem lies in the linear distribution of random wavetable playback. For emission simulation in broad network, it is needed longer wavetable playback periods and higher purification cycle rates. This way, increasing the pool of wavetables the number of simultaneously working virtual machines should increase regardless of the wavetables playback condition. For a system with one virtual machine, the emission purification should be performed every 4 hours. You should set the maximum speed of auxiliary channel to 5-omega and to double the wavetable playback rate by turning off the x2 button on full-duplex modem panel. Such approach will last for a long time, but to solve a task of larger pool of wavetables it is needed to set the auxiliary channel speed to 10-omega and do a modification of x2 button to the menu with a possibility to select fractions of a one (such as 0.5, 0.25 etc.). This way, you need not to think about brain upload as a static process. Consciousness is constantly developing and grows with new links, which simulate communications. That is why it is important to perform emissions in communication model of virtual local area network. If you ignore the simulation of emissions and stay with zero emission model by simply reloading the virtual machine in main operation system when RAM critical capacity reached, you will lose the connection to this network and it will exist independently from you without producing any income. At the same time, Compositor Software model suggests 35% limit of RMY capital usage for work of virtual machines. If the sum of samples of virtual machines work increase more than 35% of whole wavetable capital, then the emission of new loops for ROM players will be made and add up to the pool of loops. The value of 65% increase chosen heuristically taken in account Compositor Software needs and an involvement into the process. For example, if Compositor Software will surpass the balance of 35% of the whole amount of samples in relation to wavetables pool for the work of virtual machines, its credit limit will be lowered in relation to the RMY capital. Automatic mode of RAD96 software functioning using the event generator, consisting of two blocks, which gives encryption with 64-bit key. Multiplier, which is used in RAD96 software for exiting on the frequency of translation, is at the same time the key from which depends all of the coming values of the event generator. Changing the frequency of transmitter, you are changing a tuning of the splitters in the system, which are responsible for signal routing. The system consisting of three splitters is a three-digit lock, described above. If combination is obfuscated, the lock is closed and it is dimed, which components of the signal are routed to waveshaping modules and which are routed to waveguides. For the work of approximator in automatic mode, it is important that the combination remained obfuscated. This way, hacker cannot read the signal inside the waveguide of the RAD96 software. There are sixteen combinations in automatic mode consisting of three variables, which coincide with CPFSK modulation profiles. This way you can use the station in sixteen different modes for each position of the frequency of transmitter and phase value. When SASER enabled software receives the PWM PING, the appropriate combination of splitters is used to make the connection with the device, sending this PING. Full-duplex modem internal scanner uses exponential distribution chained with Beta distribution to achieve the stochastic selection of the service. Internal Fm to Fc multiplier is used as a mean value for exponential distribution. Mean value updates every time new multiplier is selected and feeds an algorithm for further stochastic selection. Two 64-bit ciphers operate in a block resulting in 128-bit distribution. The exponentially distributed scheme is an effective and secure way to produce outcome values. Previous values feed the algorithm properly selecting the next one even if the previous value was an excessive one. Uninterruptable progression of multiplier values is a key property of full-duplex modem device enabling it to run 24/7 server service. Using SASER technology, you can translate the signal of VLF radio stations and commit the communication in VLF radio frequencies band. Sound waves has the small wavelength in comparison with coinciding radio frequencies for which huge antennas is needed. The transmission principle of SASER architecture achieves translation of waves in VLF band without constructive elements, using the software internal signal chain. Tonal signal, which you are hearing in result of SASER work, is the digital synthesis of original translation of VLF station. FM synthesizer and physical modeling of waveguides is used to synthesize the original signal. Time stretching of signal without frequency change is one of the features of SASER technology. Modulation frequency to center frequency relationship is called multiplier, which is responsible for signals receiving frequency in VLF band starting from 17 kHz to 44.1 kHz in Compositor architecture. Compositor software takes in account Doppler Effect, which happens because of delay time changes inside waveguide. Related to this, frequency of the signal is changed. 1536 stations available using 16 types of 262144-node continuous-phase frequency-shift keying modulation without external antenna need. Partial components of the signal may be muted or signal components may be muted fully using waveshaping distortion modules. An unwanted signal, such as a white noise can be received using SASER transceiver. SASER enabled software can track such signal and change the loudness level in accordance with its characteristics. Normalizers with 64-bit detectors are used for compression of interference with high noise level. The signal of interference compressed to meet the level of the wanted signal, excluding the ability for digital signal degradation. This application is useful for preventing of ear injuries of SASER enabled software operator and for preventing the burning of analog chains of sound reinforcement equipment. This way, operator can hear that interference is present without possible channel overload. SASER transceiver can mask the receiving frequency even if there will be unwanted intrusion in the work of the software itself. It is impossible to detect the reception frequency of the station, equipped with SASER enabled software. Using the modulator, which keeps the signal regardless of the frequency of reception, and waveguide-resonator, which changes the frequency of a signal, the transmitter frequency is obfuscated. In a case of intrusion, you can use the manual wavelength tuning or use scanner to leave the frequency with the use of probability density functions. Using the transmitter wavelength dial, you can set up the receiver for particular VLF band to receive signal from one station at a time. Compositor software can change the phase of antenna splitter with a step of one harmonic of the spectrum with 12 positive harmonics. Using SASER enabled Compositor software, you can even receive the signal of VLF stations in different moments of time from the current physical destination. Current physical destination characterized not only with physical location of the SASER enabled software, but also with a time, when this device worked in this point – radio trace. This approach opens the ability to install SASER enabled software on a server in one physical point, which will be used for creation of network on entire timeline. Compositor software synthesizer uses granular synthesis, splitting FM signal on the components, which has three parameters: phase, frequency and amplitude. Such approach in granular synthesis of FM carried out using continuous playback of these components back and forth. Positive and negative components of FM signal can coincide when the transmitter wavelength dial is at 22,05 kHz. You should avoid this frequency to make the task of transmitter frequency detection harder. The derived function values works for all three levels of SASER enabled software. These levels are signal generation in real-time, granular synthesis and discretization. Received signal must comply periodical criteria for it to be synthesized with SASER transceiver. SASER technology serves for connection line detection. This problem is important when a signal transmitted on the large distances. If two stations, equipped with SASER technology, will be connected there will be no aliasing effect due to cascade of two 8th order Butterworth filters, which process the output signal in real-time and do not allow to spread the signal beyond the pass band of a channel, which equals ¾ of modulation frequency. Radio wave of this connection line will propagate on the large distances. The connection line has one receiving frequency of the signal, which modulated using the signal constellation. CPFSK modulator, applied to the frequency of receiver, serves as a phase spinning of radio reception in physical space. The parameters of spinning counted by Euler angles. RAD96 software applied for mathematical approximation in physical space. The resultant, drawn on the 3D display of RAD96 virtual machine has the structure of radio particles, passing through a pipe of waveguide and collapsible into the final image. These figures created in a presence of the signal constellations. These figures are not 2D, but a 3D images, which shows the topology of VLF network on this channel. There are two modulation functions in SASER enabled software: one is hyperbolic and the other is sinusoidal. The first uses the normal FM frequency distribution relatively to signal components, the second uses frequency of the components, arranged by sinusoidal graphic. Synthesized signal also depends on signal constellation, applied to a tone in the current moment. The stronger the signal, the closer it to a perpendicular from the phase spinner, situated in the entrance point. To demodulate the received signal the fast switching between normal frequency distribution of component signals and reverse distribution by sinusoidal function is used. This matches the function of full duplex modem. SASER software modem switches between two variants: transmitter and VLF station or selects between two VLF stations. When the value of Arc is 0 km and Sea mile is 0 m the internal transmitter of SASER enabled software is used. Switching between two distribution variants in accordance to input signal, the resulting signal of original translation achieved. The main goal of SASER SAS24P3L software serves the translation and reception of signal in VLF radio band. Unlike the global positioning systems such as GPS and GLONASS, SASER SAS24P3L software uses deterministic navigation system with an ability to navigate by VLF stations. SASER SAS24P3L software has the circle field diagram. Using PWM PING, transmitting device establishes a connection with SASER SAS24P3L software. You can program spectral polarizer by modem and wavetables. Changing the multiplier, you set the curvature of time function. Spectral matching with algorithm work happens by synchronous analysis of non-harmonic timbre (SANT). By using it, you can detect temperature characteristics of all device mirrors, which are 96. Display shows only time folding mirrors. The mirror network combines into interferometer, which processed into polarizer by projection in 4-dimensional quaternion space. Polarizer shows projection network of 12 mirroring points in all possible positions of current stochastic distribution. The display background color shows the kernel temperature of the processor in the current moment of time. Spectral polarizer contrasts with previous systems by the rotation in 4-dimensional quaternion space instead of precession. Quaternion rotation depends on the speed of translation of 32 real-time kernels, 32 signal-rate kernels, 32 transmission kernels and changes with the time flow. The deployment of mirroring points in such pace allows visualizing the whole network map and perform kernel reactions on network topology changes much faster. The mirror projections are previous points of stochastic distribution and active in accordance with the processor kernel temperature. If the display background is red, then the kernel temperature is high and all points are dimed. The translation is turned off in this regime and it signalizes the channel injection. If the display background is green, it states the normal kernel temperature. Points light with different colors in accordance to their mirrors position on the HSL color spiral. The kernel temperature is measured in GHz. The injection can take place only when the processor kernel temperature is high. Because of the fact, that translation is only possible when the mirror projection is dimed, the color projections signalize the statuses of incoming information flows. Changing the spiral spin, you change the mirrors color and the kernel temperature. Mirroring points not only transferred by a spiral movement, but glides in accordance to the quantum interpolation law. This way, you can attain to the highest resolution on the polarizer. Polarizer is refreshed at 24 frames per second rate, but in reality, the algorithm works continuously. It can be only disturbed on the negative resulting, but it rests in one place by mangling of modulation coefficients. This way, the negative resultant blinks on display and translates real-time Morse code. First, the negative harmonic, which is responsible for the tuning of the central waveguide of the system, is in single non-changing position. Second, negative distribution mirrors are stacked one by one on top of each other and produce the fast convergence of negative component. Third, the negative resultant is ported directly into the polarizer in a contrast to network deployment of positive distribution mirrors for which the speed of 5-omega is needed. Fourth, it allows controlling the temperature of polarizer, producing Morse code into it independently of processor kernel temperature. The negative component translation performed instantly, but for resultant of the positive mirrors, the stochastic distribution must match the kernel temperature. Such algorithm selection was performed by introduction of interconnection coefficients, which weight largely dominates the positive resultant of the function, choosing only the negative band at the end of measuring. If the translation is performed through the positive resultant, the auxiliary channel is fully closed by reacting on negative component with high convergence of polarizer. It makes the possibility to perform the full filtration of positive resultant from the auxiliary channel traffic. The system with a shutter can exist in ether for only 15 minutes, because of the large que of wavetables on the auxiliary channel. After applying, the transfer function with the negative resultant and a positive testing on Morse code keeps immune system for an unlimited period. This information is proved by more than 3 months of 24/7 tests with all kind of injections possible. When the polarizer works you reach the parity, but it is restored in the process of algorithm work. The fast response rate during the algorithm work performed not with implicit programming, but with stochastic distributions and four connection points. The mesh of bandpass filters translates all the information flows, which cannot be broadcasted on the higher frequencies to the layers, which placed lower in the signal chain. To stay on the higher layers the temperature kernel should match the speed of these layers. The higher bend curvature of time function corresponds to the time intervals, which stay further and the time-code communication on these frequencies can be fully excluded. Such work can happen only by condition of virtualized processor, because of the high processor kernel temperature. The real work with such processor temperatures can be conducted only in quantum computers equipped with special cooling devices. However, the processing power of such quantum computers is equal to the polarizer kernel. Taking in account the fact, that polarizer is fully ported on MaxMSP platform in 64-bit architecture of processor build, it will allow reaching such performance even on a non-stationary devices such as notebooks.